Golf and Rally Driving is gratifying and tantalizing, precise and unpredictable. It requires complete concentration and total relaxation, combined with a team performance. It satisfies the soul and frustrates the intellect. It is at the same time rewarding and maddening. 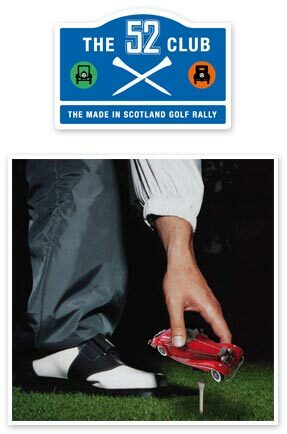 It is a fascinating combination of two passions, golf and driving. There are not many nicer or better ways of passing the time than in the Annual Made in Scotland Golf Rally, "The 52 Club". Try to imagine yourself driving down country lanes and through nice surroundings in your old favourite car and combining it with your other passion, playing golf. Made in Scotland has joined together and gained the support of a number of Clan Member companies to make this unique event both a success for the Clan Members and their clients. The 52 club has been created to give an ideal opportunity and a true test of your team companionship. Your team in this event will be tested not only in driving skills and reading a map but also your golfing ability. The team score for this event will be measured over three main stages, the first being the Friday afternoons Rally driving, secondly being the next mornings 9 holes Team Scramble golf competition and then thirdly finishing with another afternoons Rally driving back to the starting point. The scene is set for a wonderful event and we at Made in Scotland always look forward to a couple of great fun and sporty days together.